Home / Unlabelled / Will a Strong ADP Report Stabilize the Dollar? 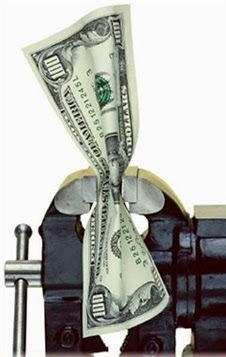 Will a Strong ADP Report Stabilize the Dollar? The key issue today is whether the ADP estimate of US private sector employment growth in April will be sufficient to fuel a dollar recovery. Yesterday's trade balance blowout prompted downward revisions to Q1 GDP into negative territory. And although the services ISM was better than expected, including an uptick in employment, many investors and the media focused on the Q1 implications. The consensus is for the ADP estimate to be around 200k, a small improvement from the March report of 189k. It had over-estimated the initial BLS report by 60k. The March ADP report was the weakest since January 2014, and a 200k rise now would be the second weakest report since then. We suspect that an ADP report in line with the 6- and 12-month averages (235-238K) would help put a floor under the dollar. However, the divergence theme that is the mainstay of the dollar bulls, has been eclipsed by other developments. Chief among these is the fading of the deflation threat, especially in Europe, helped by the continued recovery in oil prices and many other industrial commodities. This in turn has helped spark a major unwind of macro trades, which were long European bonds and stocks and short the euro. Evidence that the eurozone recovery in Q1 is continuing into Q2 can be found in the PMI data. The service PMI rose to 54.1 from 53.7 flash reading and practically no change from the 54.2 in March. The March reading matched the July reading from last year, which is the high for this short time series. This followed a small tick up in the manufacturing PMI reported last week from the flash reading as well. The composite was essentially unchanged at 53.9 from 54.0 in March. Turning briefly to the country breakdown. Germany's report was shaved from the flash while France was revised higher. More interesting is the improvement in Spain and Italy. Spain service PMI rose to 60.3 from 57.3, which is an eight year high. Output is the best since November 2006. New orders are the highest since June 2000. Employment also stood at multi-year highs. Italy's reading rose to 53.1 from 51.6. This is the highest since last June and follows the stronger than expected manufacturing survey out last week. The UK had reported weaker than expected manufacturing and construction PMIs but avoided the trifecta by reporting stronger results for the service sector, which is the largest part of the economy. It rose to 59.5 from 58.9. The consensus was for 58.5. It is the best since last August. The election is tomorrow. Participants are reluctant to extend positions. Over the past week, sterling has been one of the worst performing of the majors, losing 1.7% against the dollar, second to only the New Zealand dollar's 2.5% fall (on a more dovish central bank and disappointing data). Gilts have out-performed. The 10-year yield has only risen 13 bp over the past five sessions, compared with 15 bp in the US and 25 bp in Germany. The FTSE has fallen about 1.0% over the same time, which is also among the smallest declines over the period. The ECB meets today for a non-policy meeting. There are two main issues. First, is the haircut or discount given to Greek government bonds that Greek banks use for collateral. There is some push among to rec-consider this in light of the price erosion and deterioration in negotiations. Despite a better tone since Greece reshuffled its team, a deal as early as next week still seems to be a stretch. Remember, the Troika did not cut Greece off of aid on the election of the anti-austerity Syriza government, but around six months earlier. Increasing the haircut would reduce the amount of collateral Greek banks have and bring closer the day that they run out. The second issue is the ELA. Here there is room for misunderstanding. The ECB's repeated increase in the ELA ceiling is a function of its estimate of the real need of Greek banks. It seems like it is largely a technocratic decision. If the ECB decides not to increase the ELA this week, which is a possibility, the market may initially take this as a sign that the ECB was cutting Greece off and poses headline risk. However, this may be the wrong interpretation. It should be taken as a signal that Greek banks have sufficient liquidity for the next week. The euro rose to about $1.1270 but was sold in front of last week’s high that was just shy of $1.1300. It found support near $1.1200, waiting for the US data and North American participants. The 100-day moving average comes in today just below $1.1260. It has not closed above this moving average since last May. With Japanese markets still closed for the Golden Week holidays, the yen is largely sidelined. The backing up of US Treasury yields ( the 10-year is flirting with its 100-day moving average near 2.19% ) has not be as supportive for the dollar-yen as many would have expected. Weaker equity markets and the unwinding of positions against Europe may be taking a toll. The Australian dollar is extending yesterday's post-rate cut recovery and approached $0.8000. The apparent shift in monetary policy stance from an easing bias to neutral outweighs the mildly disappointing retail sales report. Retail sales rose 0.3% in March rather than 0.4% expected. It is the smallest rise in Q1. More important will be tomorrow’s employment report. In March, Australia reported a 31.5k rise in full-time positions. This is followed a nearly 42k rise in February. The RBA noted in its statement at the policy meeting that the labor market had improved. The risk is for some payback with the April report. That said, with softer New Zealand data and more dovish guidance, the New Zealand dollar is losing ground to the Australian dollar. The cross had neared parity twice in April. The Aussie is moving above NZD1.06 for the first time since early February. The next target is near NZD1.08, the high for the year.